William Phillips is Distinguished University Professor at University of Maryland (2001-present). Other institutional affiliations include the National Institute of Standards and Technology. His research interests include laser cooling and trapping of neutral atoms, quantum information with single-atom qubits, atomic-gas Bose-Einstein condensates, atoms in optical lattices, atomic physics analogs of condensed matter systems, coherent deBroglie-wave atom optics, and collisions of ultracold atoms. In 1997, he won the Nobel Prize in Physics with Steven Chu and Claude Cohen-Tannoudji. November 5, 1948Birth, Wilkes-Barre (Pa.). 1970Obtained BS in Physics, Juniata College, Huntingdon (Pa.). 1976Obtained PhD in Physics, Massachusetts Institute of Technology (MIT), Cambridge (Mass.). 1976 – 1978Chaim Weizmann Fellow, Massachusetts Institute of Technology (MIT). 1978 – 1988Physicist, National Bureau of Standards, Gaithersburg (Md.). 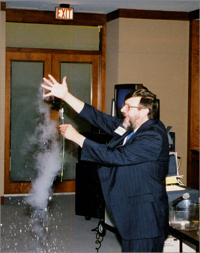 1988 – presentPhysicist (1988-1996); Leader, Laser Cooled and Trapped Atoms Group, Atomic Physics Division (1990-1996; 1998-present); and Fellow (1996-present), National Institute of Standards and Technology (NIST), Gaithersburg (Md.). 1989 – 1990Visiting Professor, École Normale Supérieure. 1992 – presentAdjunct Professor of Physics (1992-2001) and Distinguished University Professor (2001-present), University of Maryland, College Park (Md.). 1997Awarded Nobel Prize in Physics with Steven Chu and Claude Cohen-Tannoudji "for development of methods to cool and trap atoms with laser light". 1997Member, National Academy of Sciences. 1998Awarded Arthur L. Schawlow Prize in Laser Science, American Physical Society. 2002 – 2003George Eastman Visiting Professor, Oxford University. Shared the 1997 Nobel Prize in Physics along with Claude Cohen-Tannoudji "for development of methods to cool and trap atoms with laser light". Shared the 1997 Nobel Prize in Physics along with Steven Chu "for development of methods to cool and trap atoms with laser light". PhD advisor at Massachusetts Institute of Technology, "I.The magnetic moment of the proton in H2O ; II.Inelastic collisions in excited Na." and both employed at Massachusetts Institute of Technology (MIT). Both employed at the National Bureau of Standards and National Institute of Standards and Technology. Both employed at National Institute of Standards and Technology. Both employed at University of Maryland. Physicist; Fellow; and Leader, Lased Cooled and Trapped Atoms Group, Atomic Physics Division. Adjunct Professor of Physics and Distinguished University Professor. Received 1998 Arthur L. Schawlow Prize in Laser Science. Obtained BS in Physics (1970). Obtained PhD (1976). Chaim Weizmann Fellow. Almost absolute zero [videorecording] : the story of laser cooling and trapping / William D. Phillips. Lemelson Center Innovative Lives Program collection, 1995-2005.